The risk of developing cancer is more than three times higher during the first six months following blood clot in the leg, compared with the background population. Patients with the most acute type of thrombosis in the leg -- known as an arterial thrombosis -- risk developing diseases that are far worse than the blood clot itself. The risk of developing cancer during the first six months after the blood clot is three times greater than normal. 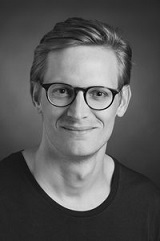 This is shown by a register-based study that medical doctor and PhD Jens Sundbøll (pictured) has recently published. Jens Sundbøll is employed at the Department of Clinical Epidemiology, which is part of the Department of Clinical Medicine at Aarhus University and Aarhus University Hospital. "It is especially, but not only, the smoking-related forms of cancer that show up after the arterial thrombosis. The risk is highest for lung and pancreatic cancer, both of which are related to smoking. However, other forms of cancer such as colon cancer and leukemia are also overrepresented," says Jens Sundbøll about the research results. In the study, Jens Sundbøll observes that the cancer risk is continuously increased but decreases in strength over time. After the first six months with 3-fold increased risk compared with a control group without blood clots, it falls during the next six months to 'only' a forty percent increased risk. Once the first year after the blood clot has passed, the risk of cancer is continuously 15 percent increased. "With the high relative figures, one should bear in mind that arterial thromboses are relatively rare with 1.5 cases per 10,000 persons annually, compared to 5-10 cases per 10,000 annually for deep venous thrombosis," says Jens Sundbøll. "If the arterial thrombosis is not correctly treated within a short period of time, the patient typically loses a leg." "It is well known that early treatment is crucial for the prognosis of many types of cancer, and our findings show that an arterial thrombosis in the leg is associated with an increased risk of cancer to the same degree as a deep venous thrombosis -- both absolutely and relatively speaking. This is an important finding, which clinicians should integrate into their deliberations. Hospitalization for an arterial thrombosis in the leg is an obvious opportunity to carry out an opportunistic screening for cancer, which I believe should be considered, just as for patients presenting with a deep venous thrombosis, "says Jens Sundbøll. The study "Risk and Prognosis of Cancer after Lower Limb Arterial Thrombosis" is based on the 6,600 Danes who were diagnosed with an arterial blood clot in the leg during the period 1994-2013. Of them, 772 were diagnosed with cancer during the twenty-year period. The study was carried out by comparing the number of cancer cases in patients with arterial blood clots in the leg with the number of cancer cases in the general population. Data from the Danish National Patient Registry were used to identify patients with blood clots, and the Danish Cancer Registry was used to follow the patients for cancer. "6,600 patients might not sound like much, but it is in fact among the largest data materials for lower limb arterial thrombosis in the world. This is also the first time that the association with cancer has been examined," says Jens Sundbøll. In a research context, the fact that cancer patients have a significantly increased risk of blood clots is well-established, and it can therefore be asked whether it is the active, yet undiagnosed, cancer that causes the arterial blood clot in the leg, or whether the blood clot facilitate the formation of a latent cancer. The answer is that we do not know. The study does not clarify the underlying causal mechanisms, but Jens Sundbøll still has a reasoned suggestion for the classical 'chicken and egg' dilemma. "We know that blood platelets and coagulation factors change in cancer patients and that the blood has an increased tendency to form blood clots in cancer patients. It is therefore likely that an undetected cancer discloses itself through a lower limb arterial thrombosis. Similarly, one can imagine that an undetected cancer located in the close proximity of the arteries supplying the leg grows into the arteries and sends off thrombi via the bloodstream down into the leg," says Jens Sundbøll. Illustration: Jens Sundbøll points out that hospitalization in connection with the arterial blood clot is an obvious opportunity to question patients about early signs of the various smoking-related cancers that the arterial blood clots are now shown to be markers for. Aarhus University.